When you are using email to apply for jobs, it's important that all your communications are as professional as they would be if you were mailing a paper resume and cover letter. That's how your job application will get noticed by the hiring manager, opened, and read. Here's advice on how to apply for a job via email including every step in the process of getting your resume and cover letter ready to send your message. When you are sending cover letters and resumes as email attachments, the first step is to save your resume and letter in the right file format. Your documents should be sent as either a PDF or a Microsoft Document. If you have word processing software other than Microsoft Word save your resume as a Word (.doc or .docx) document. File, Save As, should be an option in whatever word processing program you use. To save your documents as a PDF, depending on your word processing software you may be able to File, Print to Adobe PDF or File, Save As, and choose the PDF option. If not, there are programs you can use to convert a file to a PDF. Saving documents as PDFs helps ensure that no formatting errors will appear if the person opening the documents has a different operating system from your own. Use your name as the file name, so the employer knows whose resume and cover letter it is, i.e., janedoeresume.doc and janedoecoverletter.doc. Once you have saved your resume and cover letter and they are ready to send, the next step is to write an email cover letter to send with your documents. You can either write your cover letter directly in the email message or attach a copy of your cover letter. Either way, it's important to follow the directions in the job posting when emailing your cover letter, and resume or your application may not be considered. You can either type your cover letter directly into the email message, copy and paste from a word processing document or if the company requests an attachment, send your cover letter with the email message. Be brief and to the point. Your email cover letter should not be any longer than two or three short paragraphs. 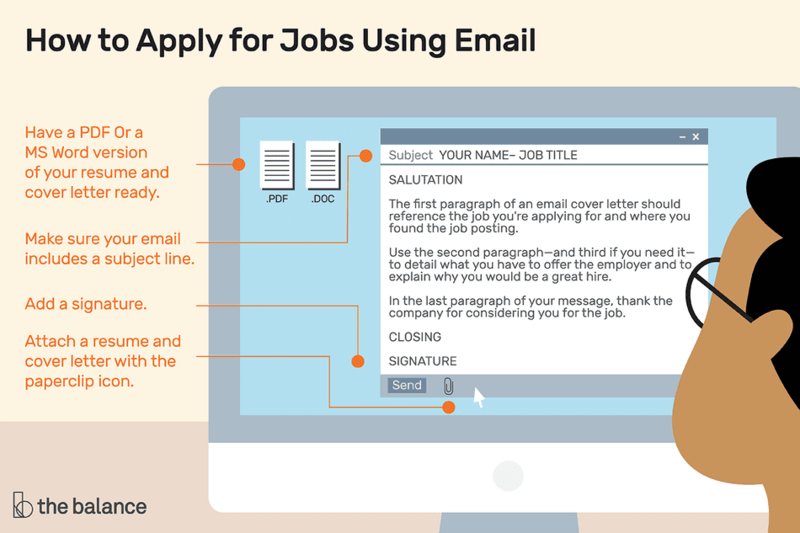 The Subject Line is one of the most important parts of the email messages you send to apply for jobs. Make sure your email message includes a Subject Line that explains to the reader who you are and what job you are applying for. Add a Subject to the email message before you start writing it. That way, you won't forget to include it afterward. It is important to include an email signature with your contact information, so it's easy for the company to reach you. Include your full name, your email address, and your phone number in your email signature, so the hiring manager can see, at a glance, how to contact you. To add your signature to your email message, click on File, Insert, Signature if you have a signature saved that you use for job searching. If you haven't created an email signature, type your contact information (name, email address, phone) at the bottom of your message. Once your email message is ready to send, you will need to attach your resume and cover letter to your message. Click on Insert, Attach File. Microsoft Outlook will display a list of files in the default file folder of your computer. If your files are stored in a different folder, click on the appropriate folder. Click to select the file you want to add to your email message, click on Insert to attach the document to your email message. In Gmail, click the paperclip image to add your documents to the message. Before you click send, be sure to proofread your email for grammar and spelling. Check to make sure that you have added a subject and your signature to the message. Then send a test message to yourself to be sure all the attachments come through, and your email message is perfect. Finally, send a copy of the message to yourself, as well as to the company, so you have a copy for your records. Add yourself as a Bcc (blind carbon copy) by clicking Bcc and adding your email address. Then click Send, and your cover letter and resume will be on the way to the employer. In addition to applying for jobs via email, you will most likely also have to apply for jobs directly online. Many employers, especially large companies, use applicant tracking systems (also known as talent management systems) to track and manage job applications. Here's how to apply for jobs online, including advice on getting your resume ready to upload, gathering the information, including a detailed employment history, you need to complete online job applications, sample job application forms, selecting job sites to use, creating accounts on job boards, applying for jobs directly on company websites, plus advice on following up after you apply.